Apply Biolage R.A.W. Curl Defining Styling Butter, distribute well. Then spray with Biolage R.A.W. Frizz Control Styling Spray. Diffuse hair until dry. Create a side part starting from the middle of the eyebrow to the top of the crown and extending in a curve to behind the ear. Separate another curved parting that is parallel to the first, approximately 1 ½ inch above the ear. 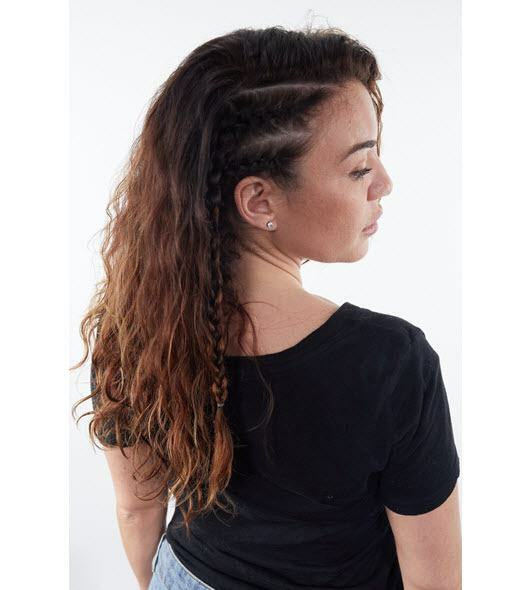 In this section, create two French braids extending from the side hairline back and around the ear. Continue a three strand braid down and secure the ends. Repeat another braid above the first two, place loose curls around the braid.